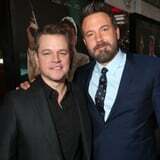 Matt Damon and Ben Affleck are teaming up again for a McMovie. That's right, the best friends are making a movie about the man who managed to rig the biannual McDonald's Monopoly game back in 2001. Jeff Maysh wrote and published the true-crime report for The Daily Beast on July 28. The article tells the story of ex-cop Jerome Jacobson, who used his job as a security officer at the firm that printed the game pieces to rig the Monopoly game. Over several years, Jacobson managed to steal over $24 million and share it with his network of "mobsters, psychics, strip-club owners, and drug traffickers." The movie will follow the FBI operation titled "Operation Final Answer" that worked to uncover the criminal ring. Damon is tapped to star in the film with Affleck attached to direct. Both actors will produce through their Pearl Street banner with Maysh and David Klawans to be executive producers. Deadpool writers Paul Wernick and Rhett Reese will adapt the story for the screen. The two have already won an Oscar together for their 1997 film Good Will Hunting, maybe they're going for their second joint award? Either way, we can wait to see what the besties cook up!